Interview with Dr. Naveen Mehrotra, a trustee of SKN Foundation. Dr. Naveen Mehrotra’s calm demeanor and smiling face is a giveaway. It is easy to realize within a minute of speaking to him that he has a deep sense of empathy and that he is a man on a mission. While he could be sitting pretty, focused on his career and his personal advancement, he instead shifted his attention to the challenges faced by many families in his community. Through the SKN Foundation that he visualized and founded, he and his team of dedicated volunteers are leaving an indelible impact on a large swath of the New Jersey community. 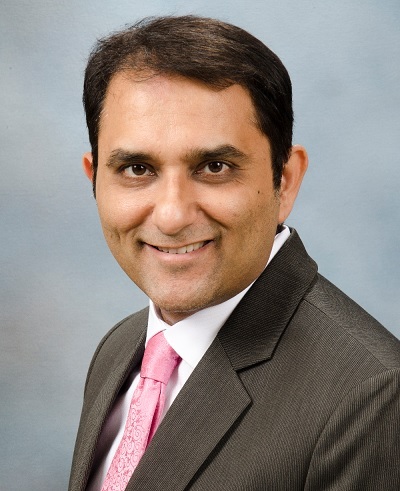 Dr. Mehrotra completed his medical training from the State University of New York at Stony Brook and his Pediatric training at the University of Chicago. Practicing in Central New Jersey with one of the highest concentrations of South Asians, he is dedicated to improving the health of South Asian immigrants. With a lack of awareness in areas such as disease prevention within the community, Dr. Mehrotra helped found the Shri Krishna Nidhi (SKN) Foundation, a community-based non-profit organization. The mission of SKN is to promote well-being through community based education. SKN believes that proper physical health, spiritual, and cultural health all lead to a person’s well-being. Dr. Mehrotra had also been a key person in the founding of the South Asian Total Health Initiative (SATHI), a research and education based initiative at Rutgers Robert Wood Johnson Medical School where he is also a volunteer faculty. In a recent interview with Venky Raghavendra, Dr. Mehtrotra talked about his organization, his vision and the upcoming SKN Hope Gala. What is the driving force behind your efforts and what keeps you energized to do what you are doing? SKN Foundation was started through personal inspiration and is an organization that works to provide support for families when they are dealing with critical issues that affect their well-being. I draw energy from my work with the families in need. This very personal engagement is what makes the work of the foundation extremely gratifying and keeps us going. Your work is spread in several areas of the community well-being. However can you share with us one specific project and family or individual and how SKN has made a difference in their lives? SCOPE (Special Needs Community Outreach Program for Empowerment) is an initiative of the SKN Foundation and is a medium for special needs children and families for education, support and socialization. Monthly educational and social events empower families to help overcome challenges in managing their child of special needs. Amongst many of our families in the SCOPE program, one particular family where the husband and wife are both software engineers along with their 5 year old autistic son are an integral part of the SCOPE program. They are extremely grateful to be a part of this support network which “has provided great benefit”. After attending one of the SCOPE educational workshops on toilet training, the mother was ecstatic to report she was able to successfully complete toilet training of her son at such a late age – a task which may be considered easy to do in a child who does not have a special need. While we take many of the day-to-day activities for granted, we must realize the value of what we are blessed with. What do you hope to achieve from the SKN Hope Gala 2017? We know there are monetary goals for events like this. Can you elaborate on that and share if you have other goals as well? At the SKN Hope Gala 2017, we want the community to better understand the families with children of special needs and to understand the difference between sympathy and empathy. We hope that we can raise awareness about these issues. . We also would like to raise funds for the SCOPE program so that the reach can be extended to include more families. What is your vision for the next 3-5 years? Our vision for SKN in the next 3-5 years and help as many families as possible. We would like to continue to build on the resources and continue to make them available to families who would benefit from them. What is your message to others who care deeply about community and social issues? Should they join hands with established groups like SKN, do something on their own or something that is a hybrid of the two? For anyone, who is interested in helping the community, I would strongly encourage them to find out an organization that they would like to volunteer their time with. They should see if the organization is true to its mission and is helping the community the way that you would want it to. If you cannot find such an organization, there are ways to undertake something on your own in a small way. I urge people to find these ways and make a difference.